Hebeatol®CG is a new functional ingredient, acting as a wide spectrum antimicrobial in skin and hair care formulas, complementing the Hebeatol® line. Cosmetic developers have few safe alternatives to preserve their products. Most of these substances may cause medium and long-term contact allergies. A study carried out by North American Contact Dermatitis Group (NACDG) in 2013, which was based on the prevalence and significance index, mentions quaternium-15 and formaldehyde among ten of the main allergens on the market, followed by another four: diazolidinyl urea (DIAZ), parabens, imidazolinidyl urea and methylchloroisothiazolinone (CMIT)/methylisothiazolinone (MIT). Thus, preservation needs before regulatory bodies restrictions are a paradox to these professionals. Finding a solution for this scenario is crucial. Mixtures derived from sugars, fatty acids and amino acids are useful options to meet this demand by acting as emollients, humectants, solubilizers and coemulsifiers. These elements also improve sensorial experience and formulas stability and provide great biological compatibility. 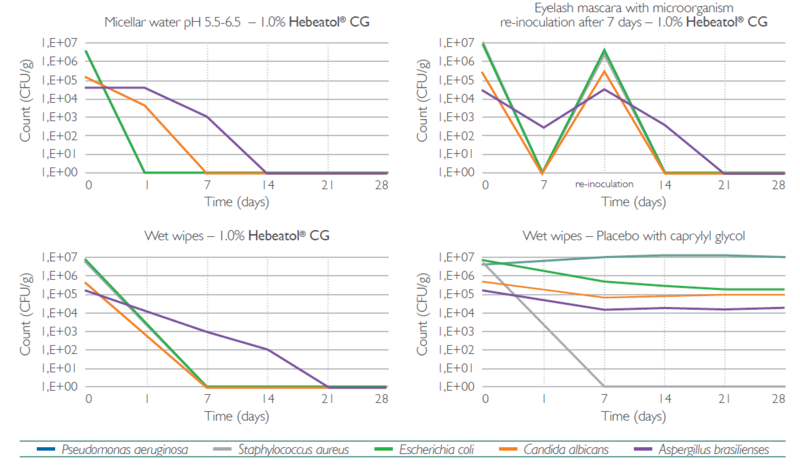 Hebeatol®CG is a new functional ingredient, acting as a wide spectrum antimicrobial and providing cosmetic developers diverse options to preserve their products. This ingredient originates by combining xylitol esters and caprylyl glycol. It is great for developing micellar waters, eyeslash mascara and wet wipes. Hebeatol® CG is an addition to the Hebeatol® Range, which also has the Hebeatol® Plus, Hebeatol® BA and Hebeatol® PS VG versions. * Approval criteria based on the CTFA protocol. - Formulas created for hair and skin care. Hebeatol® CG is a safe combination. It meets all customer needs when it comes to skin care formulas. To find out more about other options for skin care ingredients, please contact Chemyunion, globally recognized for encompassing technological expertise and market trends for the creation, development and manufacturing of innovative active ingredients, basic and functional excipients, classical and alternative preservatives for health and personal care, reaching consumers all over the world through pertinent brands. Find out how easy it is to innovate with Chemyunion!